MyQuVigen™ nanoparticles are unique combination of superparamagnetic iron oxide and quantum dots. They provide high magnetic moment and bright stable fluorescence, ideal for controllable magnetic manipulation with extensive, multiplexed fluorescence imaging. MyQuVigen™-SH fluorescent magnetic nanoparticles (emi 535, 585, 615, or 635 nm) provides you the flexibility of coupling to various molecules at your choice through simple bioconjugation reactions. Their maximal fluorescence emission is at 535, 585, 615, or 635 nm and can be excited at 488 nm or shorter wavelength. MyQuVigen™ – SH fluorescent magnetic nanoparticles or the downstream complex is easy to be separated using a magnetic rack (Cat#A20006). MyQuVigen™- SH (emi 535, 585, 615 or 635 nm) can be ideally conjugated to your choice of antibody for isolation or labeling of cells (e.g. CTCs, stem cells) from a mixture of cell population obtained from tissues or organs. 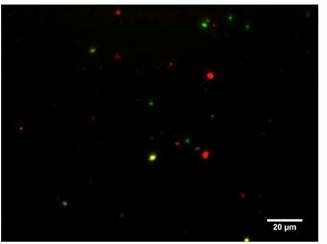 The isolated cells are tagged with strong fluorescence and can be directly applied for microscope imaging or other fluorescence-based cell analysis. The isolated cells are also viable and can be further cultured or used for downstream molecular analysis such as mRNA isolation and RT-PCR. Cell separation with MyQuVigen™ nanoparticles eliminates the use of columns, so cells are not exposed to the mechanical stress from passing through the column matrix. Magnetically separated cells are highly purified and retain their viability, ideal for downstream applications. MyQuVigen™-SH fluorescent magnetic nanoparticles (emi 535, 585, 615 or 635 nm) (Cat# 41001) are provided in phosphate buffered saline (PBS), pH 7.4. Each vial contains 1 ml of solution with a particle concentration of 1 mg/ml, which is enough for binding 20 million cells. Note: SMCC is used to crosslink the amine groups from antibody and the -SH groups from MyQuVigen™. SMCC based crosslinker is suggested because of its superior chemical stability when used with our nanoparticles and its ease of use. Note: For smaller molecules with similar size as SMCC, use SMCC as the limiting reagent in the reaction. No purification is needed before mixing with MyQuVigen™-SH nanoparticles. Mix samples from step 3 with MyQuVigen™-SH nanoparticles. Incubate overnight under continuous rotation at room temperature. Wash 1-3 times with PBS or other buffer solution. Remove non-magnetically captured solution. Resuspend washed MyQuVigen™-Antibody/molecule conjugates into preferred buffer, ready to use.